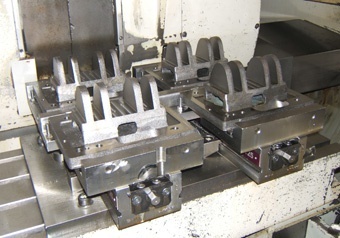 Providing production and prototype engineering services to OEM companies across the off-road and power generation sectors is heavy work which quickly takes its toll on machining centres. That is why Woolley-GMC specifies Roemheld Hilma DS125 double clamping vice systems for all its steel casting work as they know the vices can take the strain of power milling. Woolley-GMC specialise in producing engine backplates and manifolds along with components for fuel injection systems and pulley systems. The company designs and makes its own fixtures in-house as all of its production is non-standard, pushing fixtures and vices to the limit. They design and machine their own outsize jaws for use with the Roemheld vice systems. Because of the demands of this hostile engineering environment, reinvestment in plant is a key part of the company’s success and as part of its replacement programme, 12 machines will be replaced within the next 4 years. In addition, the company is just about to take delivery of three new machines: a 500mm pallet horizontal, a 1m bed vertical and a Twin spindle lathe. As part of this capital investment, a further 19 Roemheld Hilma DS125 double clamping vices are being installed. This will be supplied via AC Hydraulics, the Roemheld distributor for the area, who have been supplying product to Woolley-GMC for over 8 years. Part of Woolley-GMC’s success is that it has developed a niche role, supplying volumes that are not big enough for automotive contractors but that are too big for the smaller ‘jobbing’ shops. With medium to low volume production and repeat orders, Woolley-GMC produce a wide range of steel components from 1.5m x 1.2m engine back plates through to phosphor bronze pins. Repeatability and tolerances are key, which is why the company sticks with tried and tested fixture components specifying manual clamps, magnets or Roemheld vices, dependent upon the fixture design and purpose. Weekly production volumes vary to meet the delivery requirements of customers, with scheduling taking place up to 6 months in advance. As a result, shift patterns and working activities of its 80 plus staff have to be flexible, with multi-tasking and weekend working utilised as required. To keep ahead of the demands of the industry and broaden its manufacturing potential, Woolley-GMC is currently working for full environmental certification and the TS60949 certificate. capacity as the company continues to generate more and more orders: primarily from the UK, but also from gains within Europe and the USA. The company is predicting an increase in turnover from £10 million to £15 million over the next five years.